Artist impression of Shanghai Disneyland’s Zootopia land. Shanghai Disneyland Park is preparing a brand new themed land based on a recent surprise hit. That new exotic land in question is Zootopia, the city where any animal can be anything they want! As the park’s eighth theme land, the Zootopia area is set to bring the big mammal city to life, a franchise-first for any Disney park worldwide. Fans of the award-winning movie will be delightfully immersed with greetings by Nick Wilde and Judy Hopps and the city’s various iconic landmarks. The new themed land will invite guests to fully immerse themselves in the mammalian metropolis of ‘Zootopia,’ ‘where anyone can be anything,’ and come along on an adventure with Judy and Nick, the lead characters from the hit, Academy Award-winning animated movie. With a brand-new attraction, entertainment, merchandise, and food and beverage offerings, the new land will provide guests with even more to experience and enjoy at Shanghai Disneyland than ever before. Although locating the themed land in Shanghai may seem disappointing to fans of the West, it’s important to factor in Zootopia‘s huge significance in China. Locally titled Crazy Animal City (疯狂动物城), it earned a massive ¥1.5 billion ($235.6 million USD), making this not only the country’s second highest-grossing release of 2016 behind The Mermaid (美人鱼/美人魚) but also the most-successful animated release in China’s cinema history. Plus, considering how the titular city was partially inspired by Shanghai itself, it’s easy to see how a Zootopia-themed land placed there is a perfect fit. While no opening date has been announced, construction is scheduled to commence later this year. It may take a while to come into full fruition, but this sure looks to be a dream come true for major Zootopia fans, including myself. Time for me to start saving up for a trip to Shanghai! 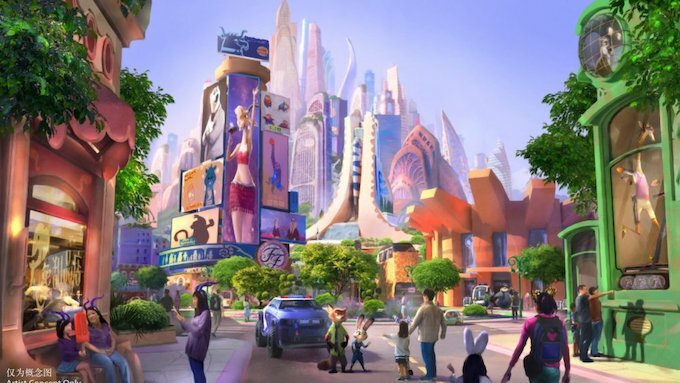 Are you excited to see Zootopia come to life in Shanghai Disneyland? Would you be keen to visit the area? Tell us your thoughts in the comments! Deep down in New Zealand, Karl "Karlamon" Smith is a Kiwi who is passionate in animation, seeing it as an artistic medium that expresses vast creativity and brings unique characters and worlds to life. Whenever an animation-related fact pops up, it will more than likely be cemented in his brain for a long time. Some of his favourite animated movies include Zootopia, Balto, Bolt, Over the Hedge, The Fox and the Hound, the How to Train Your Dragon series, The Iron Giant, and The Prince of Egypt. Prior to contributing to Rotoscopers, Karl has served as a bureaucrat on Ice Age Wiki, and a moderator/site builder/news reporter on Animation Source. Karl is also a Computer Science graduate who is now studying Digital Design in university. That, and with his additional fascination in aviation, he hopes someday to be both an animator and a pilot (if that is even possible).